Penn GSE AHEAD - How Can Higher Education and Anchor Institutions Work with High Schools to Advance Employment and College and Career Readiness for Philadelphia Youth? The final session of a five-session seminar. 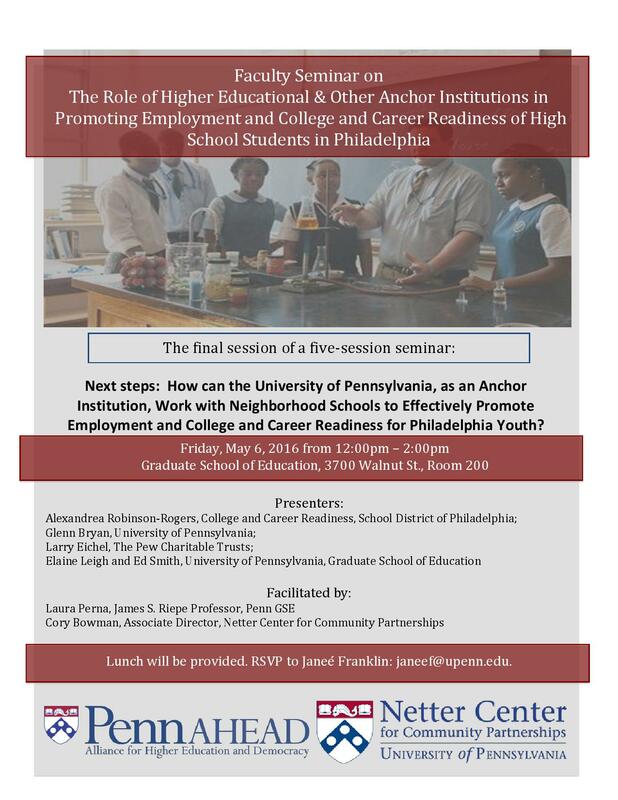 Join Penn AHEAD and The Netter Center for the fifth and final session on the role of higher educational and anchor institutions in promoting college and career readiness of high school students in Philadelphia. This session features Alexandrea Robinson- Rogers, College and Career Readiness, School District of Philadelphia; Glenn Bryan, The University of Pennsylvania; Larry Eichel, The Pew Charitable Trusts; Elaine Leigh and Ed Smith, The University of Pennsylvania Graduate School of Education. The panel is facilitated by Laura Perna, James S. Riepe Professor, The University of Pennsylvania Graduate School of Education; and Cory Bowman, Associate Director, The Netter Center for Community Partnerships. Lunch will be provided. Please RSVP to Janeé Franklin: janeef@upenn.edu.